This is one of those drives that you wouldn’t expect it to be a USB drive concealed within. It looks more like something someone would stash a little Tylenol within. 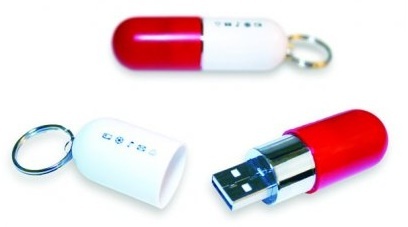 Instead it’s a small USB drive that allows for you to store random files inside. It’d be a humorous keychain for nurses and various medical workers to carry around. Of course it won’t discriminate if you’re not within the medical field, it’ll still safely store your files just the same. Plus it can be attached to your keys as a keychain. Once again this is another one that the keychain part is attached to the cap. Which makes me a little concerned that it would stop clinging to the lid so well and the drive itself, with all of your data, would be dropped and lost. The serious down side of the drive is that it’s only a 64MB drive. That still leaves room for 40 photos though or 30 minutes of MP3s. Still, it’s not exactly a decently sized drive. The drive will cost you £10.95 or about $18 from GiftLab.